There’s nothing elegant about the look of milkweed. In fact, to most people, it is what its name suggests: A weed. But get close to a cluster of its unusual flowers and you may be charmed. Few native wildflowers smell as sweet as common milkweed. 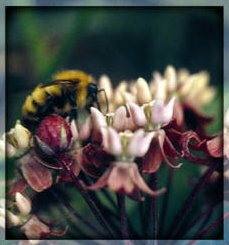 The plant uses its powerful scent to attract bees, which provide pollination like Pony Express riders. As they crawl across the blossoms, their legs unwittingly pick up tiny saddlebag-shaped pollen packages to deliver from one flower to another. The result of pollination are those late-summer packages of fluff that delight children and which the Navy once used to fill life vests. For us, however, milkweed is a room freshener. Somewhat drab and droopy, the flowers are not the stuff of fancy bouquets. But pick a stalk – don’t mind the sticky juice, from which Thomas Edison once tried to make rubber – put it in water, and place it in a dark corner of a room where it will stand unseen but not unnoticed as it sweetens the air with its fresh summery scent.